Through their Spay/Neuter programmes, the HSGB hopes to reduce the vast numbers of puppies like these who end up in shelters or meet worse fates on the streets of our islands. The Humane Society of Grand Bahama (HSGB), in partnership with The Kohn Foundation’s (TKF) Bahamian Animal Rescue Committee (B.A.R.C.) is pleased to announce its next major field spay and neuter clinic to be held February 2-6, 2009, in Pinders Point. The HSGB is deeply indebted once again to the kind folks at the Church of the Good Shepherd for allowing the use of their parish hall for this important community service. The goal is to sterilize at least 250 dogs and cats during the five days of surgeries. As always, the surgeries will be free to pet owners, and the clinic will include important educational initiatives. This clinic is being funded by The Pegasus Foundation (U.S.), Amigo’s Fund, The Kohn Foundaton, and a private donor from the U.S. The project, called BARC-ANEW (Bahamian Animal Rescue Committee - Animal Neutering Education & Welfare) aims for at least two similar clinics per year in various locations on Grand Bahama. In 2007, BARC-ANEW sterilized 600 animals in addition to the 400 surgeries done by Grand Bahama vets through our ongoing voucher program. In 2008, due in large part to the stumbling economy, and the HSGB’s move to their new facility on Coral Road, only one clinic was held; in West End in April, when 213 dogs and cats were sterilized. Also in 2008, local veterinarian Dr. Owen Hanna of Caribbean Veterinary Health & Healing Centre assisted the cause tremendously by performing 789 sterilizations through the HSGB's ongoing voucher programme, supported by the Grand Bahama Port Authority. The HSGB aims to reduce the number of stray, roaming and unwanted dogs and cats by sterilizing as many owned animals as possible. The project also promotes responsible pet ownership and kindness to all animals. The HSGB welcomes back again Dr. Robin Brennen, of New York City, chief veterinarian for this project, and founder of Pets Without Vets, a non-profit organization. She and sixteen other U.S. veterinarians and veterinary technicians have not only volunteered their time for this clinic, but will pay their own way here and in many cases, use their valuable vacation time in order to support this effort. The HSGB has a special request for local dog “breeders” to consider sterilizing their breeding dogs. The HSGB has taken in an inordinate number of “purebred” dogs in the last year, including German Shepherd Dogs, Belgian Malinois’, Shih Tzu’, Jack Russell Terriers, Rottweilers, Dobermans, Chihuahuas, Yorkshire Terriers, Chow-Chows, Great Danes, Poodles, Labrador Retrievers, to name a few, and all manner of mixes thereof. 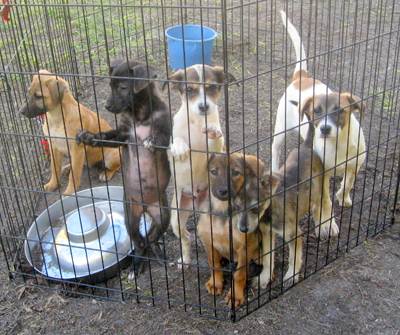 A responsible breeder would ensure their sold puppies were healthy, spayed and neutered, went to a good home, and would require a right of return, and thus never end up in an animal shelter. It is evident to HSGB staff there are far too many irresponsible breeders on this island, selling puppies to people who do not take care of them, many of whom perpetuate the problem even further by breeding the puppy they bought. The HSGB is left to pick up the pieces for these poor animals. Separate and special mention should be given to the number of Pit Bull Terriers and mixes thereof, which have always inundated the HSGB shelter, and whose numbers increase almost daily. They are the most mistreated, misrepresented, abused and forsaken dogs on Grand Bahama, by far. After this clinic, available funds for this project will be depleted. The HSGB hopes that Government, local private individuals, corporations, and local Government entities will step up and help continue this critical project, to solve a problem which affects everyone on many levels, including economically. Tourists and potential investors who visit our island are repelled and horrified by the animal abuse/neglect they see on our streets. The HSGB is committed to positive change, but needs the entire community and indeed the country to participate in the solution. Pet owners and breeders are urged to contact the Humane Society at 352-2477 to arrange for their animals to receive free sterilization during the West End BARC-ANEW spay/neuter clinic. The HSGB will even make arrangements to pick them up and bring them home again if necessary. School administrators, teachers, civic groups and interested individuals are encouraged to contact the HSGB and make arrangements to visit the clinic for educational tours.